since it has been so hot the past few days, i haven't been in the mood for heavy meals. so the other day for dinner i made this chickpea salad with cilantro and spinach. it was so light and refreshing (and healthy too)! ryan has already requested that i make it again soon. i have a feeling that this salad is going to be a staple in our house over the summer! ps: this recipe was featured over here on my friend jenn's blog. drain and rinse the chickpeas, place in a bowl, and set aside. in a food processor, add the spinach and pulse until finely chopped. add the chopped spinach to the bowl with the chickpeas. in the food processor, add the cilantro, onion, lime juice, sugar, olive oil, garlic powder, and onion powder. pulse until smooth. 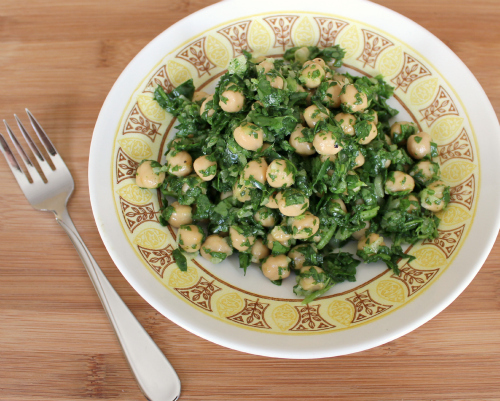 pour the cilantro dressing over the spinach and chickpeas. stir well. season with salt and pepper to taste. I really liked your blog. I will follow you on Bloglovin.